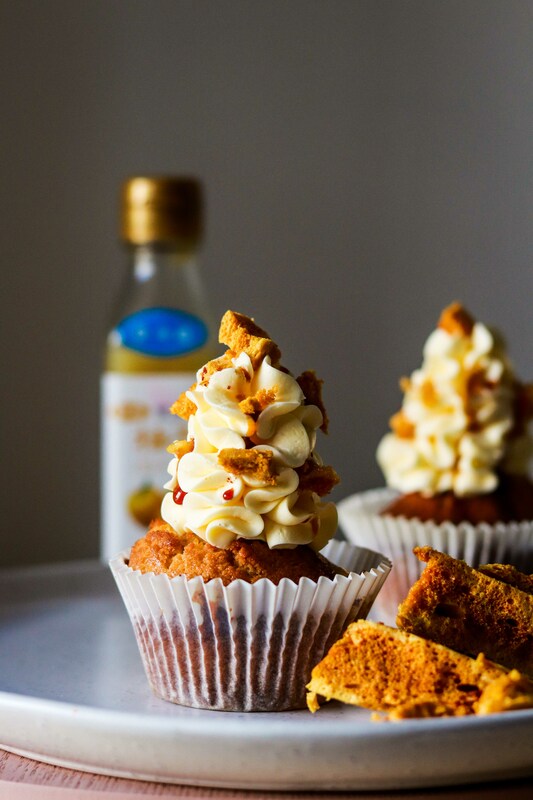 These honey lemon cupcakes with yuzu swiss meringue buttercream are heavenly – light, refreshing and full of citrus flavour – and the additional homemade honeycomb on top gives you a perfect sweet crunch when you bite into it. I’ve always wanted to try to make desserts with yuzu because i just find it has a floral, citrus aroma that makes it so special among all the citrus. It might still not be a popular item in western countries, but it has always been part of asian culinary culture, especially in Korea and Japan. Yuzu fruits are not readily available in Australia, and I had been on the search of yuzu puree/juice for a while. That said, feeling exhilarated is probably an understatement the moment i saw it on an asian store’s shelf a couple of weeks ago. In this recipe, the subtle incorporation of lemon and honey is just to complement, if not enhance, the yuzu flavour, which is the hero of these cupcakes. So I guess I should do a little update of my school life here. TIME DOES FLY. I am now in the superior level – the third and final stage of my certificate III of Patisserie @ Le Cordon Bleu Sydney. During this term, we are focusing more on marzipan, mousse-based cake and entremets (basically, entremet refers to multi-layer mousse cake of various flavour combination and textures). I used to feel terrified of making entremets as the timing was so tight to complete an entremet within a 3.5-hour practical class and my cakes were usually not frozen solid enough for the final glazing. However, as I got to practise more, I’ve learnt to organise better and work faster in the kitchen and I start to feel more in control of things. The cakes that I share below are two of my favourite entremets made at school. The first one is passionfruit and white chocolate entremet that taste luxurious from top to bottom, and the second one is gianduja entremet bursting with tropical flavours. Next week, we are going to have a trial of making our own entremet for our final assessment. It’s the time for all students to show what they’ve learnt in the past nine months and I can’t wait to test my ideas and bring my design into life! Enjoy your weekend! In a mixing bowl, sift and combine flour, baking powder, baking soda and salt. These are your dry ingredients. Set aside. In another mixing bowl, using a hand-held mixer or an electric mixer with a paddle attachment, beat butter, honey, sugar, and lemon zest on medium high speed until creamy and smooth. This will take around 4-5 mins. Add eggs, one at a time, and continue beating for 1 min. Add milk and vanilla. Continue beating for 30 secs. Turn to medium-low speed, gradually add the softened butter cubes, one at a time, until incorporated. Continue beating until a silky smooth texture is reached. Add yuzu juice and salt, and beat until well combined. Store in refrigerator until ready to use. Pipe the buttercream on top of each cupcake with your favourite nozzle, and top with honey comb pieces. You should totally try Yuzu if you ever get the chance Nic! And thank you, I am actually almost done with the course so I’m not sure how to feel haha. Have you tried this as a full-size cake? Did it bake up just as well? Hi, it works as well as a cake. 🙂 But you’ll have to double the recipe for the cake part and also increase the baking time to 45-60 mins until the centre part is cooked through. Also, if you want to frosting the cake, I’m not sure if the Buttercream is enough for the whole cake, so you might want to make 1.5 times the original recipe for the buttercream just to be safe. Good luck!